OS grid reference approx NZ 935 010. 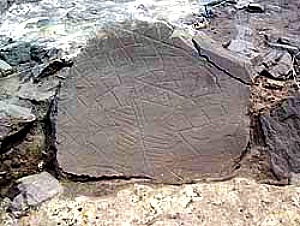 In the late summer of 2003 during the the devastating fires that destroyed up to two-and-a-half kilometers of Fylingdales Moor to the south-west of Ravesnscar, north Yorkshire Moors, a round-shaped flat piece of stone was uncovered by archaeologists from English Heritage bearing strange shapes and lines. This stone has been referred to as The Map Stone or The Fire Stone for obvious reasons. Today a cast of this curious stone can be seen in Whitby Museum. The actual site of the find is ‘protected’ and now covered over again with heather and grass, but it is ‘roughly’ just north of the A171 near Flask Inn which is 6 miles north-west of Ravenscar. [Please keep to the designated footpaths across the moor]. At the time of the moorland excavations many other artefacts were uncovered including a smaller stone that has tiny hollows or cup-marks carved onto it. The carved stone with its strange map-like patterns, zig-zags or chevrons and linear lines is now considered to date back to the Neolithic period some 4,000-5,000 years ago, according to English Heritage archaeologists, though some historians place it in the Bronze-Age? It was found underneath the burnt heather and turf set within a low ring of boulders forming a cairn, and next to it was a smaller piece of stone with cup-marks. The thinking at the time was that the stone, which was originally larger, was a sort of map of the area showing tribal settlements, mountains and other features, but it is now thought by archaeologists to be a funery grave-cover with depictions of the after-life. The stones were recorded and photographed in situ and then the turf and heather re-laid to protect the artefacts from further erosion. In all some 2,400 artefacts and other sites were found exposed in the area of devastation (up from a previously-known 150) – ranging from Mesolithic flints, 185 carved stones, ancient trackways, watercourses from the local alum industry, to slit trenches from World War II. Fletcher, Terry., Dalesman, February 2005 Volume 66 No 11, Dalesman Publishing, Skipton, North Yorkshire. Categories: Rock Art, The Map Stone From Fylingdales Moor In North Yorkshire | Tags: The Map Stone on Fylingdales Moor in North Yorkshire | Permalink.